Applications are available at the Human Resources Dept., 155 Deer Hill Ave., Danbury, CT 06810 or at www.danbury-ct.gov beginning February 5, 2019. The application must be completed in its entirety. Omissions, false, misleading or inaccurate information will result in rejection of the application. Applications should be completed and returned to the Human Resources Department as soon as possible. Application review and hiring is ongoing. Therefore, those applications received first may be considered first. Only those applications returned directly to Human Resources by the applicant will be considered. Please contact the Human Resources/Civil Service Department at (203) 797-4598 or [email protected] if you need assistance or if you have any general questions. Applications will be reviewed to determine if they are complete and meet the minimum requirements for the position. If an applicant is selected for an interview, he or she will be contacted by the Human Resources Department to schedule a meeting. Those candidates selected through the interview process will continue in the selection process by participating in further testing which may include but is not limited to background checks, drug screens, etc. If any one of these tests are not passed, the candidate will be immediately eliminated from consideration from this hiring process. Please be aware that participation in the testing and recruitment process does not guarantee continuance in the remainder of the hiring process nor does it imply or constitute an offer of employment. Offers of employment and start dates of employment are only valid through the Human Resources Department. Candidates are not authorized to begin employment with the City of Danbury until they have passed all post offer tests and have been notified directly by the Human Resources Department. Any other offer of employment from any department other than the Human Resources Department will be considered null and void. All communications between the City of Danbury and applicants will occur through the Human Resources Department. This includes but is not limited to: scheduling interviews, appointments for post offer testing, offers of employment; start dates, etc. All applications and required documents must be submitted directly to the Human Resources Department. The following information is only a general description of the recruitment and hiring process and is not all-inclusive. Please note that any and/or all of the components of this process may be changed by the City of Danbury with or without notice. Additionally, the City of Danbury reserves the right to modify the order sequence of testing as may be appropriate. This is a semi-skilled manual work in the repair, construction and maintenance of grounds, equipment, and buildings. Employees are responsible for the satisfactory performance of light and medium manual labor tasks, minor maintenance work, light automotive equipment operation and related tasks on City park properties. Applications may be obtained from the Human Resources/Civil Service Department, Danbury City Hall 155 Deer Hill Ave Danbury, CT 06810 or at www.danbury-ct.gov. The Danbury Public Library is seeking an enthusiastic, technology savvy, part-time Librarian. This person will be responsible for being the program assistant for adult programs, as well as providing reference desk services. We are looking for someone who has a comprehensive awareness of the best readers’ advisory resources, is well-versed in library reference and research techniques, is eager to respond to the information needs of library customers and is committed to creating an exceptional customer experience. Health Inspector in the Health & Human Services Department. Candidate must be able to perform inspections, plan reviews and enforcement duties in administering the Connecticut Public Health Code and City Ordinances under the direct supervision of the Director of Health. 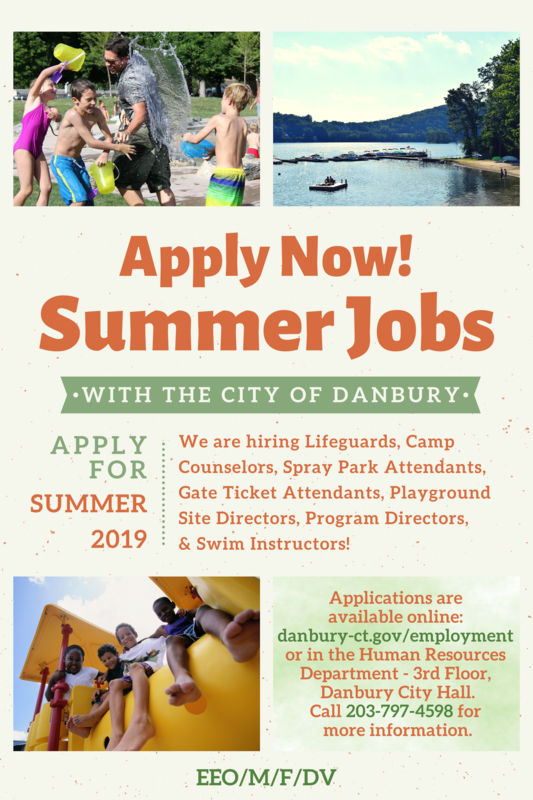 Applications are available at the Human Recourses Dept., 155 Deer Hill Ave., Danbury, CT 06810 or at www.danbury-ct.gov. The application must be completed in its entirety. Omissions, false, misleading or inaccurate information will result in rejection of the application. This position will remain open until filled.